Modi’s first interview is more a demonstration of his political personality and savvy rather than being policy-laden. Indian Prime Minister Narendra Modi will visit the United States starting this Friday, September 26, for a five day trip. The trip is highly anticipated by foreign policy analysts in the United States and India since it is Modi’s first trip to the United States as prime minister. It is also his first visit to the U.S. since Washington lifted a visa ban on Modi. In addition to meeting with U.S. President Barack Obama in the American capital, Modi will visit New York, where he is expected to address the United Nations General Assembly. Additionally, he plans to address up to 20,000 supporters in Madison Square Garden, as part of a strategy to build strong ties with Indian-Americans. He is reported to be aiming at the consolidation of Indian-Americans as a strong lobbying group. Moreover, he is expected to meet with Indian-Americans in positions of power. Modi additionally plans to use his visit to the United States to make a pitch for American investment, especially in manufacturing, in India. Modi is thus aiming at a strategy of marketing that previous Indian leaders have not attempted. It is not surprising, then, that his first interview since becoming prime minister is essentially an introduction to the people of the United States. This interview, given last Sunday to CNN’s Fareed Zakaria (who is himself of Indian origin) shows Modi as a determined but personable individual with a strong humanitarian streak. 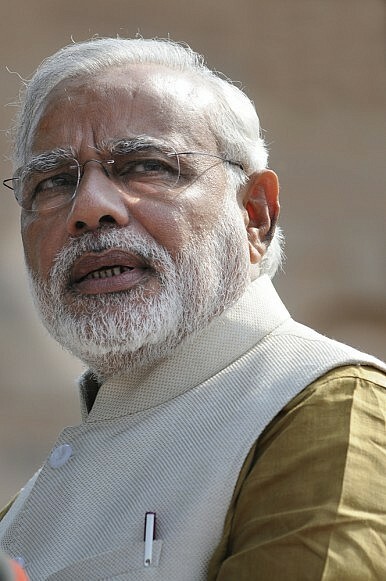 In other words, Modi used the interview to repackage himself for an American audience as someone more similar to the Western stereotype of Indians: he spoke about cooperation, humanity, and yoga in Hindi, projecting a feel-good and folksy vibe that was more reminiscent of Mahatma Gandhi than the stiff, technocratic style of former Indian Prime Minister Manmohan Singh. Modi’s diplomatic answers though were necessary in many places as he walked a fine line between various positions and goals. For example, he avoided condemning or accepting Russia’s intervention in Ukraine and instead chose to reflect on the tragedy of conflict and how innocent people died when Malaysian Airlines flight MH 17 was shot down. More importantly, the first third of the interview consisted of Zakaria asking Modi various questions that all had a China angle. For example, Zakaria asked Modi if India would be the next China and grow at a rate of 8 to 9 percent, to which Modi replied that “India must only become India.” While praising the capabilities of Indians, Modi avoided committing India to an unrealistic growth rate or implying that India would follow a predictable, Chinese-style economic trajectory. This gives him wiggle room in terms of policy while still coming off as optimistic. Modi also gave evasive answers on questions about Chinese actions in the South China Sea. While many have criticized Modi’s answers in the interview for being vague and evasive, Modi had few other options other than to be vague and evasive given the complexity of Indian relations with countries such as China and Russia. For example, while India supports the principle of not changing territorial borders through physical force, it can hardly publically condemn Russian actions in Ukraine due to its close ties with Russia. This is realpolitik at its best. Nonetheless, there were some interesting and novel things in the interview. Perhaps the most important were Modi’s comments on Indian Muslims. Asked if he was worried about the creation of an Al Qaeda branch in India and South Asia (AQIS), Modi responded that “if anyone thinks Indian Muslims will dance to their tune, they are delusional. Indian Muslims will live for India. They will die for India. They will not want anything bad for India.” This was perhaps Modi’s strongest ever public embrace of India’s Muslims, a development that is being seen positively by Muslims in India. It is also reinforces Modi’s message that he wants to focus on development for everyone and move past communal issues unlike some other individuals in his Bharatiya Janata Party (BJP). Modi’s strong embrace of democracy was also convincing, especially for a man who has often been accused of authoritarian tendencies and of being an admirer of China. Modi argued that he loved democracy because democracy allowed Modi, who is from a poor background, to become India’s Prime Minister and defeat an entrenched political family. This is certainly true and there is little to doubt that Modi accepts democracy, despite what others may say. However, Modi’s vision of democracy is more of as a method of selecting leaders rather than of a continuous democratic decision-making process by already elected leaders. In this, Modi’s views seem to be similar to patterns of decision-making by American presidents. Finally, Modi told Zakaria at the end of the interview that he is “not the ‘not-working’ type. I derive pleasure from my work. Work gives me relaxation too. Every moment I am thinking of something new: making a new plan, new ways to work. In the same way that a scientist draws pleasure from long hours in the laboratory, I draw pleasure in governance, in doing new things and bringing people together. That pleasure is sufficient for me.” This is a relatively rare psychological insight from a man who usually does not talk about his own hobbies or emotions. It sheds light on an individual whose actions can be explained by a constant striving to do more. Although the effectiveness of Modi’s initiatives varies, he is clearly the rare Indian politician who is more interested in governance rather than the perks of governance. Despite the interview’s platitudes, it serves as a valuable introduction for Modi to an American audience and shows that he can be shrewd and diplomatic in answering questions. Those who are interested in a more meaty idea of Modi’s views can watch his Indian speeches. Modi’s first interview as prime minister serves another purpose: that of setting the stage for Modi for an overseas and international audience.